If you are interested in a comfortable accommodation that can provide facilities even for children, then you can browse through the hotels located in South Kensington area. Most of them offer a variety of rooms and suits suitable for any number of passengers. For example, you can take a look at Millennium Bailey’s Hotel official website. You will definitely be thrilled by their accessible offers and great services. Located in a very popular area, you can visit such local attractions as Hyde Park, Kensington Palace, Trafalgar Square and Royal Albert Hall in only a couple of minutes. You will also like the modern interior design, combined with elegant architectural elements. The friendly staff is at your disposal 24/7. In addition to this, your staying includes facilities like Wi-Fi, currency exchange, theatre reservations and many more, transforming your trip into a stress free one. In order to get a Luton to Millennium Bailey’s Hotel Transfer by rail there are three main options. First of all, you could take the bus from Airport Bus Station (every 10 minutes), followed by a train from Luton (every 30 minutes) via King’s Cross St. Pancras (every 5 minutes). This journey will take about 60 minutes in total. The second option is a bus from Airport Bus Station (line 757 – every 30 minutes) via Marble Arch (line 74 – every 10 minutes). This journey lasts about 1 hour and 32 minutes. You can also choose a bus from Airport Bus Station (line 888 – every 10 minutes) via Luton Airport Parkway Station (every 20 minutes) and Victoria Coach Station (every 10 minutes). This trip takes 1 hour and 43 minutes from your time. A Luton to Millennium Bailey’s Hotel Transfer by car can be done by taking the M1 motorway. Luton Airport is at a 33.3 miles distance from Millennium Bailey’s Hotel. This journey will take about 50 minutes, without including traffic. A Luton to Millennium Bailey’s Hotel Transfer with 247 Luton Airport Transfer is going to take about 1 hour and 17 minutes, including rush hour traffic. 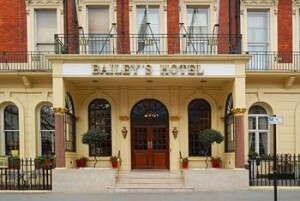 The price for a Luton to Millennium Bailey’s Hotel Transfer starts from 56 GBP.